There has been growing concern amongst fans recently regarding the policy of increasing ticket prices. 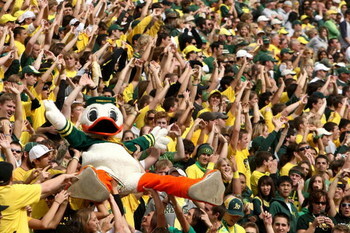 While ticket prices have risen steadily in past seasons in confluence with Oregon’s improved success, the increase in 2012 season ticket prices were dramatic enough to give some fans pause. Reserved tickets increased 14% over 2011, while the end zone sections, where many of the more budgeted fans reside, saw increases of over 30%. Couple that with increases in mandatory donations required of many ticket holders and you have a situation where the prices have given some fans more than pause, leading to a reduction in season ticket renewals. This year, the Athletic Department announced it had a 90% retention rate from 2011 to 2012, a 6% decrease from the 96% renewal rate following Oregon’s run to the BCS Championship. Furthermore, the renewal rate statistics did not disclose whether that number represented the percentage of season ticket holders renewing or the number of seats renewed. There were reports that season tickets were available in all sections as late as August. The Register-Guard wrote about a perceived disconnect between the fans and the Athletic Department. The concern is about a program making decisions that appear to have more short term impact instead of focusing on building a future fan base. Many current fans visited Autzen in the good old days when it was easy to get a ticket. Of course there were a lot more losses back then, too. For many years, the Ducks had family-pack tickets that were inexpensive and provided General Admission seats in the end zone for two adults and three children. It was a great way to get kids in the stadium – and not just family members, but friends, cousins, and neighbors. 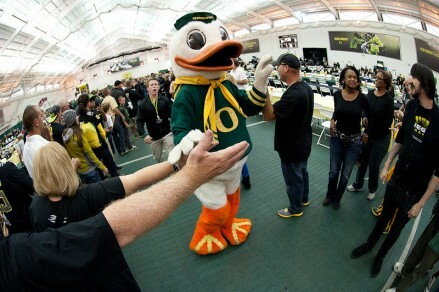 I’m sure the idea was to get more fans at the games, but it likely resulted in creating generations of future Duck fans. No one understands the need to cultivate the future fan base like both major and minor league baseball, often having promotions and activities for youngsters. Meanwhile, the NBA has failed to be as accommodating, financially or otherwise, to fans. By one analysis, NBA tickets cost nearly twice the price of attending a MLB game. Oregon seems to be focused on a disciplined effort to maximize their income by increasing the prices until they exceed demand. Considering tickets were available the day of the game on a couple of occasions this season, it appears they may have reached the peak. It seems to me to be wise to focus on more than just selling kids the latest expensive jerseys. Kids are fickle. They will move on to the next thing if given a reason, and $60 for a jersey that changes every year may at some point be reason enough for many. Oregon is known for their creative thinking. Here are some creative ideas that I think the Athletic Department should consider. *Set aside 500 sets of the family packages for cheap and have a lottery each year for these. Winners are not allowed to renew, but would be offered a one-time discount to upgrade to regular season tickets. Every year the State of Oregon holds special draws for hunting permits, and I know bow and rifle hunters that can’t wait to enter their name for these. The same idea could work here. Who doesn’t like to enter and win a drawing for something special? *The same could be done with a limited number of parking spaces. Currently, several thousand dollars per year in athletic fund donations are required to have the opportunity to buy a parking space. Take 50 of those and have a drawing among season ticket holders. Winners get a prime space to tailgate for one game at a reasonable price. Longtime fans would love that opportunity, and it would also create goodwill. *Bringing back more kid-friendly activities would help draw in younger fans. It used to be common to give out team football cards each year but I haven’t seen that for a long time. I once went to an Atlanta Braves game where they gave out baseball gloves. They may have been cheaply made, but do you think the kids waving them around all game cared? How about a free, special-edition hat; or perhaps a football for the first 3,000 kids? And speaking of kids, it’s not the value, as much as the exclusivity of having something that only a few can have. For the Pac-12 Championship Game, nearly half of the Moshofsky Center was set aside for family activities like video games, football passing targets and even a bean bag toss. It may have contributed to lower beer sales, but I saw a lot of kids and parents enjoying themselves. While maximizing revenues is an important consideration, the Athletic Department should also focus on the future by continuing the past tradition of reaching out to kids and families of all income levels. By building a generation of future fans, they can take a big step towards insuring that, unlike the NBA team to the north, all their games continue to sell out long into the future.